How much polymeric sand is needed to fill my joints? Overfilling or underfilling paver joints with polymeric sand can lead to project failures. In this blog post, we’ll explain how much sand is needed to fill the joints and the steps on how to do it. One of the most important steps in a polymeric sand installation is proper compaction of the sand into the joints. Ideally this is done using a vibratory plate compactor. 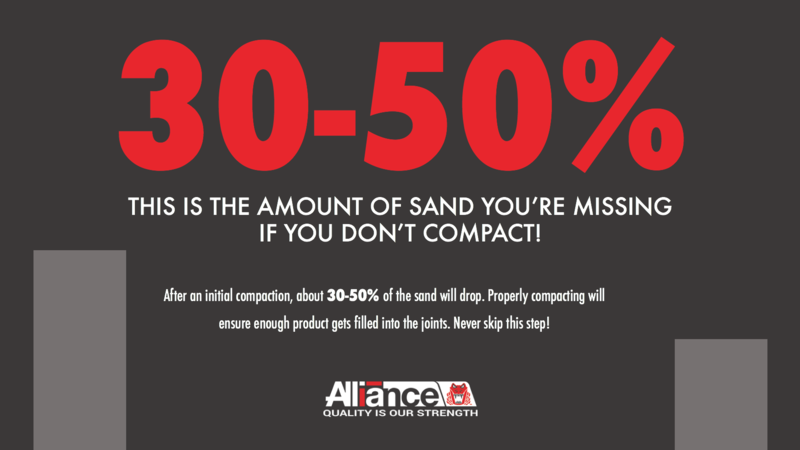 After the initial compaction, you’ll notice that the height of the sand will drop dramatically ... about 30-50%! This is why it’s important to sweep in more sand to ensure the joints get filled up to 1/8 inch (3mm) below the paver's edge or chamfer. The best way to fill paver joints with polymeric sand is to start by spreading the sand across the surface using a hard-bristle broom. During this phase, you’ll want to make sure the sand completely fills the joints. It’s important to note here that you should be working with clean joints. If there’s any residual material in between the joints, you’ll have to completely remove it before getting started. You never want to mix different materials within the joints. As you’re sweeping, leave a layer of sand on the surface to aid in the vibrating and consolidation of the product into the joints. A common mistake we see during the final sweeping of excess polymeric sand from the surface is using too much force. Sweeping too aggressively can push sand out of the joints, leaving too little product to set up properly. When sweeping excess product from the surface, we recommend doing a first pass with a hard-bristle broom, then going back with a soft-bristle broom. Again, take care to leave the height of the polymeric sand at least 1/8 inch (3mm) below the edge or chamfer of the paver. Follow these guidelines, and you’ll always achieve the optimal amount of sand in your joints! 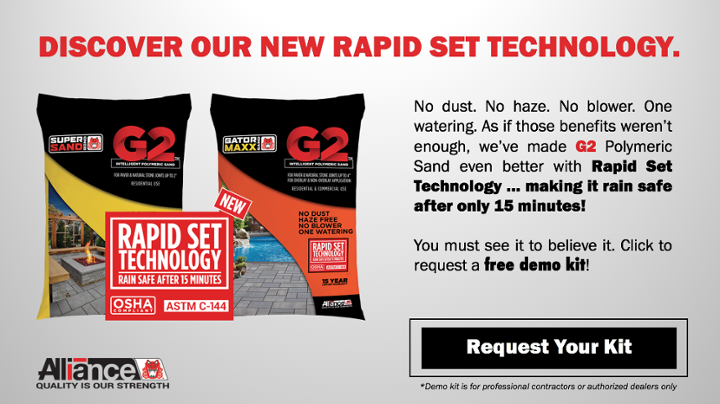 For complete details on how to install our Alliance brand G2 Polymeric Sand, click here.